'It's Going To Be Tough': Santa Fe Students Return To School After Shooting : The Two-Way The shooting happened less than two weeks before the end of the school year. "I don't want that last day to be my last memory of my senior year," one student said. 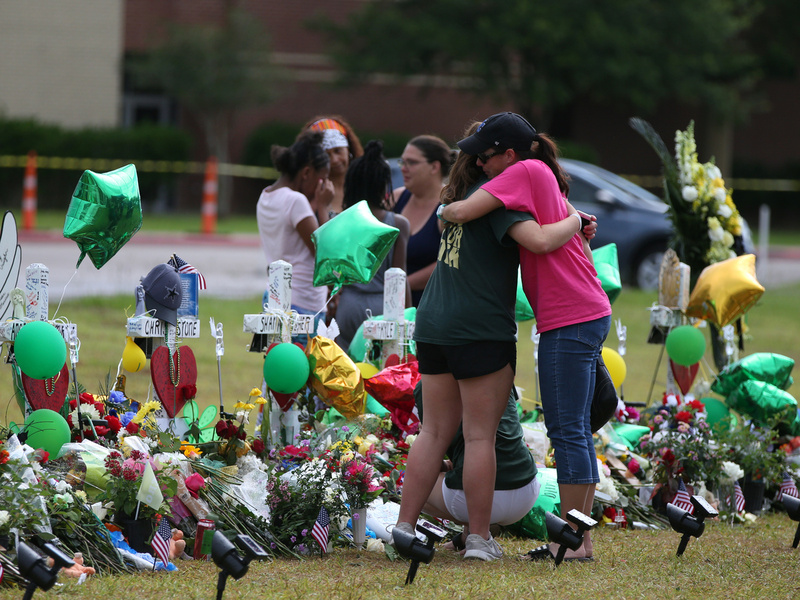 People mourn last week at a makeshift memorial in memory of the victims killed in a shooting at Santa Fe High School in Santa Fe, Texas. Students resumed classes at the school today. The shooting happened less than two weeks before the end of the school year. "There is never a good time for a crisis, and we know this especially affects graduating seniors," Santa Fe High School posted on its website. Thursday is the last day of the school year, and graduation is Friday. "I don't know if we'll ever be ready to go back to school," senior Kaitlyn Richards told CNN affiliate KTRK. "But I don't want that last day to be my last memory of my senior year. I just want to know I can see all my classmates once again." Lidia Cleveland's son is among those going back to school today. Though she offered to walk into the school with him, he wanted to go on his own. "It's going to be tough, coming back for the first time," Cleveland told the Houston Chronicle. "But he needs to face it and try to move on." Students were to gather at 10 a.m. local time for an assembly to honor those who died, according to WFAA, an ABC affiliate in Dallas. Some changes have been made to the building and security protocols, the station reports: "There will only be one entrance and one exit at the school. Walls have been built to close off classrooms effected by the shooting. ... Students will need identification to enter the school and will allowed to bring one parent or legal guardian. There will be additional law enforcement on hand for the remainder of the year and students are not allowed to carry backpacks or large purses." The returning students reportedly won't have to deal with schoolwork and finals, though; WFAA says the school finalized grades where they stood the day before the shooting, and that teachers will provide a chance for extra credit over the summer. The school says additional security from law enforcement will be in place, and counseling will be available for as long as it's needed. Dimitrios Pagourtzis, a 17-year-old student, has been charged with capital murder and is being held without bond in nearby Galveston, Texas. About a dozen other people were wounded in the attack. "There's going to be a lot of crying, you know?" Santa Fe senior Annabelle O'Day told WFAA. "I don't know if I am prepared for it. I won't be able to tell you if I'm prepared for it until I walk into that school."